Was Jesus White? And How Did We End Up With A White Jesus Anyway? How Did Jesus Become White? Just how did we end up with a white Jesus? It's a longer story than you'd think. 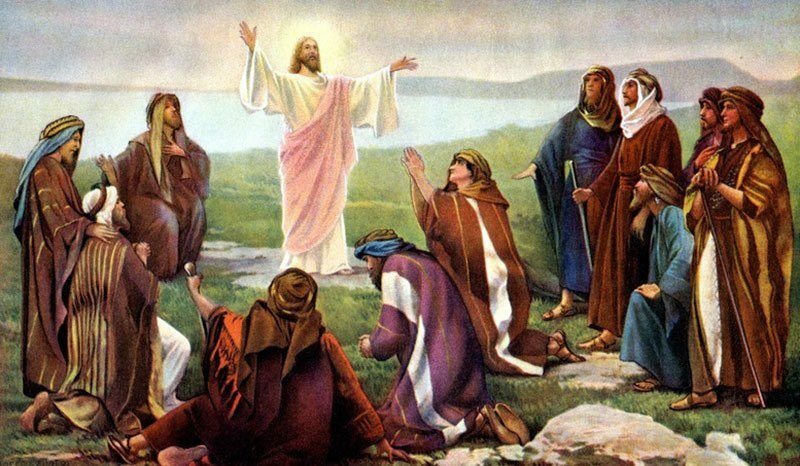 Jesus has been the object of veneration and worship in the West for nearly 2,000 years, to the point that his mildest utterances (correctly attributed or not) have occasionally formed the basis of whole religious movements. As Jesus’ following spread over time — sometimes via devoted missionary work and sometimes by comparatively less saintly methods — people across multiple societies have cast images of Jesus in their image. Doing that is relatively easy since, believe it or not, the Bible contains no description of Jesus’ physical appearance. We do, however, know a thing or two about demographics, which means that if Jesus did exist where and when the Bible says he did, he certainly was not white. And yet today, we envision him as just that. Why? 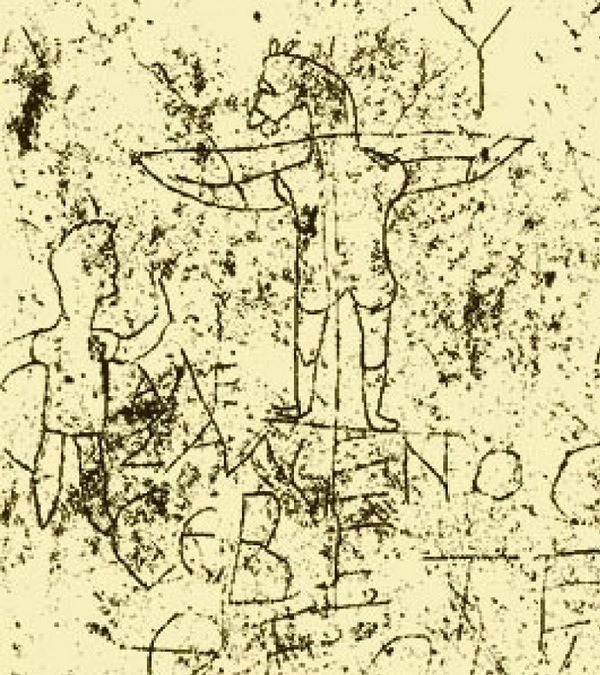 As far as anybody knows, not even an amateur attempt to depict Jesus can be found from a time before about the second century. This has a lot to do with the position Christians held in Roman society at the time: though conditions varied from place to place, it’s fair to say that following Jesus was not a career-enhancing move until sometime in the fourth century. Prior to that, most Christians depicted their lord symbolically with the ichthyos, the “Jesus fish” you’ve seen on a million hatchbacks, or the Chi-Rho, which combined the first two letters of the Greek Christos as a kind of secret shorthand to help believers find each other and their places of worship. Positive depictions of Jesus date from around the third century. 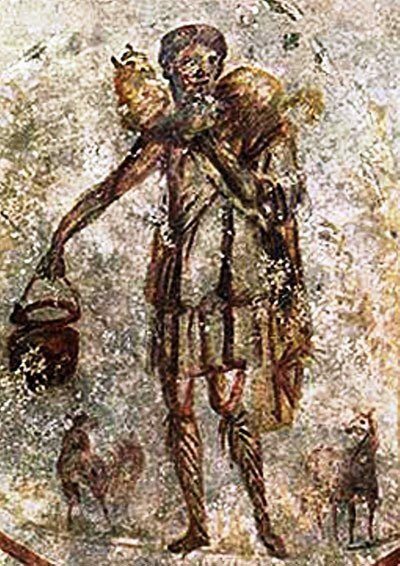 In this fresco, found in the St. Callisto catacomb in Rome, Jesus is shown as a Good Shepherd with olive skin and totally contemporary dress for the time and place. Jesus is even shown without a beard, which was common among Romans at the time, but unheard of for Judean men. The catacomb where it was found probably began as a Roman family tomb, but expanded into a place of burial and secret worship after the family converted to Christianity. It may also have served as a convenient bolt-hole during the Great Persecution of Diocletian in the late third century. Already in this image, possibly the oldest surviving attempt to represent him, Jesus is clearly being depicted as if he had been a Roman of Italian or Greek extraction. While the modern concept of representational art might look askance at this sort of thing, remember that Jesus had previously been depicted as an abstract symbol or arcane combination of letters. In a real sense, what Jesus would have actually looked like in life was irrelevant to the people who met under this fresco. What was important was the connection they felt to him and to each other. What Would The Boston Tea Party Revolutionaries Make Of The Modern Tea Party Movement?